When Is The Best Time To Find Your Next IT Sales Job? Do. Not. Wait. It’s now! There’s so many reasons we want to change jobs. You’re bored. You’ve been there too long. The culture has changed. You realise you’re doing 150% of sales quota and not getting rewarded for it. The promotion you’ve been promised still hasn’t happened. The commute is turning into a pain. You want to spend more time with your family. By this time, it’s probably too late. By this time, you’ve had enough, busy creating a six-month exit strategy (tops!) and you’re starting to feel desperate. Waiting until this point to find a new sales job in tech creates stress and this will come across in your job search. I’m not saying to pack up your desk, grab your coat and just walk out. While this seems a little illogical, make your next move when you’re loving work, you’ve got your mojo, you’re absolutely smashing it, and you’ll exude confidence and power. When you’re on top, it’s unlikely that you’re going to be out there suffering through that pain of dealing with hordes of recruiters, searching job boards, trawling LinkedIn for new jobs, and getting annoyed at people never getting back to you. What if — what if — you get offered a better job 3 months, 6 months before you hit that downward slope? You weren’t out there looking for something new, but an amazing opportunity just came your way? Sellers get headhunted all the time. But how in control of that are you? Not very. Sure, you can kick up your networking a notch and start pumping out content on LinkedIn. But let’s face it. These aren’t activities you’re usually doing when you’re not actively looking for a new job. Life in 2018 is all about optimisation. Forget calling a taxi and hoping it’ll show up. Instead you track when your Uber is coming and message if it’s running late– or cancel. You sit on the sofa and book your next holiday on AirBnB instead of walking to the local travel agent. At work, AI is getting layered over the top of your CRM so you can tell which leads are hot without having to sift through info. Using technology to optimise your tech sales career? It’s now possible and so this is the part where I tell you how to do it. I created TalentHunter.AI after seeing so many people go through this same cycle. I knew there was a solution to help keep tech sales professionals moving from strength to strength. And I knew technology could help solve this puzzle — where traditional recruitment was failing. 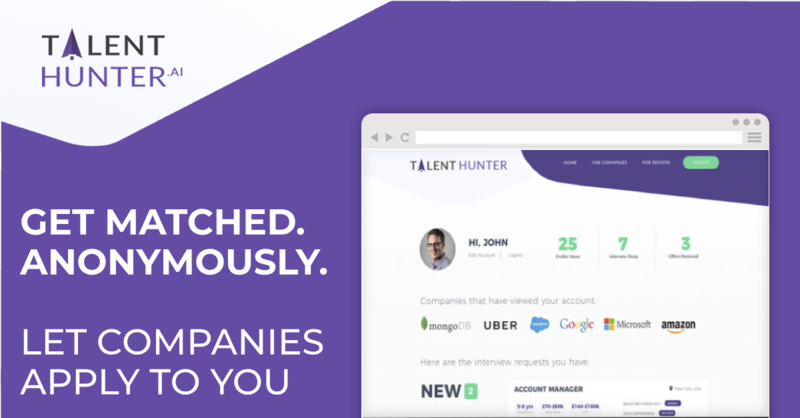 With TalentHunter.AI, you put yourself out there, but you do it anonymously. Create your digital profile on our platform and let us know what would make you consider a new opportunity. Would love to work from home? Interested in startups? Bigger salary? Want to move up to management? 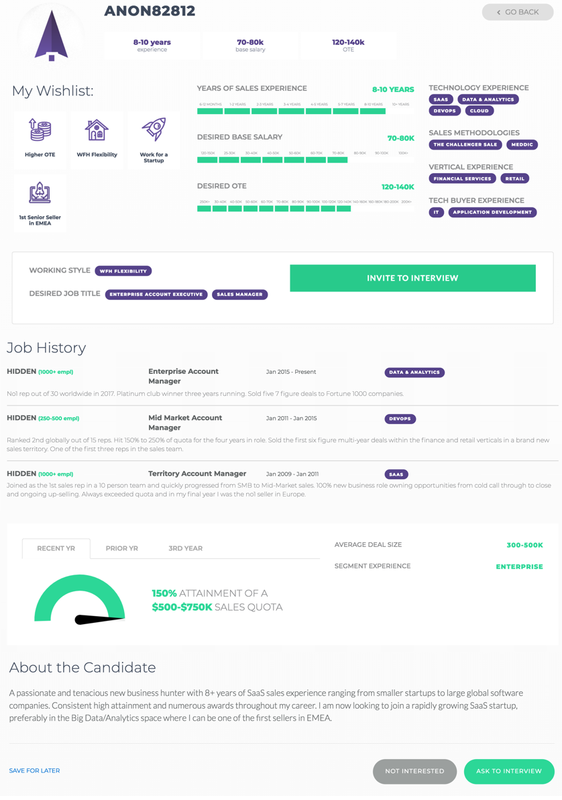 Here’s an example of an anonymous candidate profile. Pretty cool… right? Using our AI algorithms, your profile gets anonymised and matched with tech sales career opportunities that meet your requirements. You’ll receive transparent interview requests directly from the companies. You get to choose when to start the conversation. No swiping right required. With our platform, we only present you with opportunities you’d actually consider. Oh, and guess what else? It’s free — sign up is super quick and easy with our chatbot, and no CV is required. Join us and let your next career opportunity find you. So go for it, put yourself out there and get matched to new career options on your terms. Be in control and know your worth. There’s no reason you shouldn’t be able to have your cake and eat it too. Create your own free talent profile here.